My thanks to Cindy for giving me a full sample set of Blackstone inks! Blackstone inks is made in Australia and as far as I can tell available only at Justwrite. Blackstone isn’t a well known maker of inks but they have a nice range of colours available for an affordable price. I will be giving away the entire set of Blackstone inks. Read all the way to the end to find out how to win it. 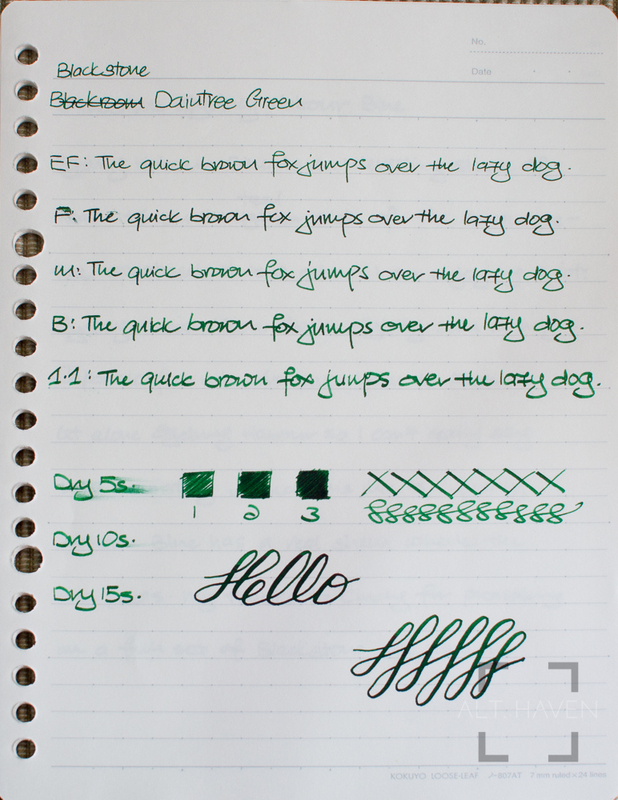 Daintree Green is the green ink among Blackstone’s ink offerings. No, I didn’t spell that wrong, it isn’t raintree green. Daintree Green shades well even in my Lamy EF nib. It goes from a dark forest green to a bright grass green. I quite enjoy this ink. It is relatively wet and has nice flow. Sydney Habour Blue is an interesting shade of teal. It’s on the teal side of the turquoise - teal spectrum. It’s a colour I am enjoying a lot. Sydney Habour Blue shades slightly even in my Japanese fine nib. I’ve never been to Australia let alone Sydney Habour so I can’t really say how accurately named this ink is. Sydney Habour Blue has a red sheen where the ink pools. Blackstone Barrier Reef Blue is a wet, wet ink. Filling it in my titanium nib pen is probably quite a bad choice. Barrier Reef Blue shades well and has a strong red sheen when you have a good amount on the page, of course. It’s also dependent on the paper you use. Barrier Reef Blue goes from a light, bright sky blue to a deep saturated dark blue. When the red sheen shows through it feels like life surfacing on the reef. This is one of the surprising inks of the Blackstone Colours of Australia series. I had expected a standard blue but it has been a pleasant surprise. Uluru Red is the red ink of the Blackstone Colours of Australia series. Uluru Red was strangely gooey and it was experienced by others as well. It was seemed to be caused by the surfactant trying to gel, according to an email with Blackstone. I’ve tried shaking my sample vial but it doesn’t seem to help. However it didn’t seem to do any harm to my Pilot Metropolitan. Apart from that, Uluru Red is a nice dark red that dries looking a little brownish. It shades well in wider nibs. There is a new version of Uluru Red that should have the gelling issue solved. Note my sample is at least many months old. Also though, I would like to give away a sample of Uluru Red, I’ve managed to spill the majority of my sample. Luckily there was enough to complete the reivew. This is the last Blackstone ink I have. Though it is named Black Stump, it has a decidedly brown undertone. I guess that’s very much in keep with the name of the ink in its own way. It has some subtle shading in the boarder nib size. Strangely, though it is quite a lubricated ink I had some ink flow issues when I had it in my Kaweco Supra. I’m putting it down to a bad pen and ink combination for now. This is an interesting deep dark brown ink. For a chance to win my set of Blackstone Colours of Australia ink samples (minus Uluru Red, of course), drop a comment below. Tell me which among the Blackstone inks here do you like the best? This giveaway will end 17th October and is only for people residing in Singapore.